What were Shakespeare's politics? As this study demonstrates, contained in Shakespeare's plays is an astonishingly powerful reckoning with the tradition of Western political thought, one whose depth and scope places Shakespeare alongside Plato, Aristotle, Machiavelli, Hobbes and others. 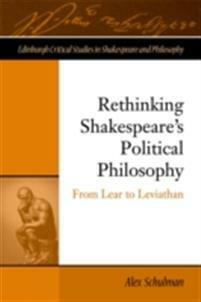 This book is the first attempt by a political theorist to read Shakespeare within the trajectory of political thought as one of the authors of modernity. From Shakespeare's interpretation of ancient and medieval politics to his wrestling with issues of legitimacy, religious toleration, family conflict, and economic change, Alex Schulman shows how Shakespeare produces a fascinating map of modern politics at its crisis-filled birth. As a result, there are brand new readings of Troilus and Cressida, Coriolanus, Julius Caesar, Antony and Cleopatra, King Lear, Richard II and Henry IV, parts I and II , The Merchant of Venice and Measure for Measure.